SINGAPORE - Singapore is dancing the cha-cha with the issue of its rapidly ageing population. An older generation familiar with the dance will know that in the cha-cha, dancers take steps forward and backward, but essentially remain in the same position in spite of the flurry of movements. So the forward steps are things like the Pioneer Generation Package to acknowledge the contribution of seniors; the move to encourage employers to rehire workers till the age of 65 now, and 67 from 2017; and the increasingly age-friendly infrastructure. The steps back come in the form of policies that are based on the formula of x number of people aged 65 and older who will need to be supported by working-age adults - based on the assumption that once they reach 65, people turn from being assets to liabilities, draining the nation's resources. These "old age support ratio" assumptions form the basis of many of Singapore's long-term plans. Another is the National Health Survey, which looks only at people aged 18 to 69 . Why do people aged 70 years and older fall off the radar, especially when the focus is health? This is not unique to Singapore. 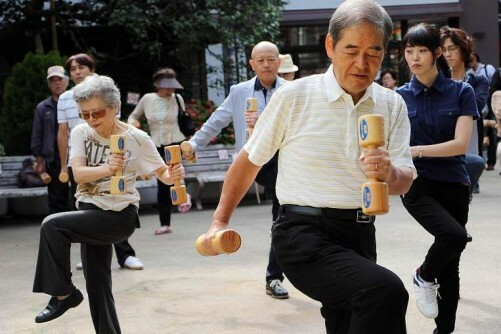 The issue was highlighted in the World Health Organisation's just-released Report On Ageing And Health: "Older people will have to be included in vital statistics and general population surveys." Yes, people do grow older and will get more chronic ailments and be less physically limber. But as WHO director-general Margaret Chan says: "There is no 'typical' older person." This is because there is no standard correlation between chronological age and the loss of physical and mental abilities. With greater focus on keeping healthy and with better medical treatments available, people are generally not just living longer but also maintaining their health for many more years. A recent news report featured a 105-year-old Japanese man who set a world record for the 100m dash. It took him 42 seconds, against Usain Bolt's 9.58sec record set in 2009. Still, it was a feat few thought possible for a centenarian. If he can run 100m at age 105, how much more physically able must he have been at age 65, 75, 85 and even 95? Was he a burden to society in the last 40 years of good health? It depends on whether he had the opportunity to contribute or if he was put out to pasture based purely on his chronological age. The WHO report, which looked at an ageing world brought on by longer lives coupled with fewer births, says: "One of the challenges to developing a comprehensive response to population ageing is that many common perceptions and assumptions about older people are based on outdated stereotypes. "This limits the way we conceptualise problems, the questions we ask and our capacity to seize innovative opportunities." It adds that ageism, where people are discriminated against simply because of their age, is "an even more pervasive form of discrimination than sexism or racism". Singapore is not immune from such stereotyping. Take the website Our Population Our Future, under the Prime Minister's Office, which states: "For Singapore, people are our one natural resource." Yet, on the same page, it says: "With improving quality of life, Singaporeans remain more active than before in their older ages. Nevertheless, an ageing society means there are fewer working-age adults for every person aged 65 and above." This mental categorisation of people into two distinct groups - between working-age adults and the elderly who need to be supported - can become crippling for Singapore as the Republic's population is ageing rapidly. By 2030, Singapore will have 900,000 people aged 65 and above. Singapore can choose to dismiss this large pool of people as "dependent" and unproductive, or work harder at keeping them within the workforce and helping them stay active. Which path it takes could well determine the future economic growth of the country. If the public, private and people sectors are able to take ageism out of the equation, Singapore's workforce will no longer be limited to people aged 20 to 64 years of age. The dependency ratio will similarly refer to only seniors in need of support, and not to a whole chunk of the population who falls off the radar because of their chronological age. Future generations will likely live even longer and healthier lives than today's generation, which already surpasses what their parents and grandparents achieved. Singapore and Singaporeans need to move away from the mindset that any chronological age - be it 65, 70 or older - defines the able, and those needing support. Singapore should take advantage of its people's increasing lifespan, which has been increasing by about three years every decade. Based on the WHO report, it would not only be foolish, but also possibly even suicidal, for Singapore to ignore its one major resource - just because that's the way the rest of the world view their older people.